Dynamat Xtreme Bulk Pack For Kit Car. DYNAMAT XTREME is a Black, light-weight, elastomeric, butyl and aluminum vibrational damper. For use on bulkheads, doors, floors, boot, roof and bonnet to reduce road noise and internal resonance. When applied to a vibrating panel, noise is converted into silent energy. It is supplied in thin (1.7mm), flexible, easy to cut and mould sheets which conform to curves and. Bond easily to sheet metal and other hard surfaces. You can apply Dynamat in patches (25-50% area coverage) to dampen resonation of a specific panel. Or you can apply it over an entire area (such as the floor, doors, or boot) to create a sound barrier and vibrational damper. 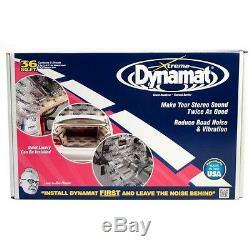 Even a small amount of Dynamat can make a big reduction in noise levels. For example, applying Dynamat to the doors of your vehicle can reduce road noise from 3-6dB. Complete coverage of an average vehicle can reduce road noise by as much as 18dB! We recommend applying Dynamat to any surface you can easily reach such as the doors, rear panels. 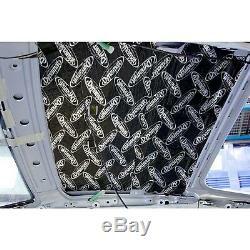 Bulkheads, floors, roof, boot or under the bonnet. Installing Dynamat requires only a few tools: Craft knife or scissors, roller tool, rags and a solvent- based cleaner. Applying Dynamat to the panels around your car also prevents panel distortion by stiffening the flimsy sheet metal. Or fibreglass into a more solid non-resonant baffle. Suitable for use in temperatures between -10°C to +60°C (14°F to+140°F). Material can withstand temperature extremes between -54°C to +149°C (-65°F to +300°F) and. Is highly resistant to aging. Total coverage 36 square feet (3.25 square metres). 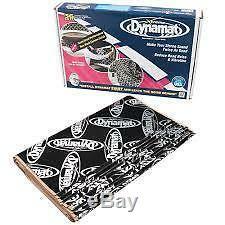 Contents: (9) 18"x 32" (457mm x 812mm) pieces of Dynamat Xtreme. Application: Use on bulkheads, doors, floors, boot, roof and bonnet to lower road noise and internal resonance. Weight 1 Kg per sheet. Dynamat Xtreme Bulk Pak #DYN10455. The acoustic loss factor "n" is used as a measure of a material's ability to damp structure-borne sound. By stating how much vibrational energy (in steel sheets for instance) is converted to heat rather than sound. For constructions containing several layers of damping material, the combined loss factor "n comb" is used. The theoretical maximum loss factor is 1 (no vibration). An undamped 1mm thick steel panel has a loss factor of roughly 0.001 at 200 Hz. Multiple layers of Dynamat Xtreme improve sound damping even more. Use scissors, knife or die to cut Dynamat Xtreme to the desired size and shape before removing the release liner. Next, remove dust, grease, moisture, and other foreign matter from the application surface. Peel off the release liner. The simplest application technique is to bend the mat slightly and attach it along its shortest edge. Press the mat firmly into place, using a roller for larger pieces. The roller reduces the risk of leaving air pockets, which reduce Dynamat's sound damping capacity. The temperature of the mat and application surface should not be below room temperature during fitting. Heating the material is not necessary. Thickness: 0.067 (1.7mm). All goods will be supplied with a UK VAT invoice. Visit out website at carbuildersolutions to see our full range of products. You can also request our FREE Catalogue and signup to our Newsletter. 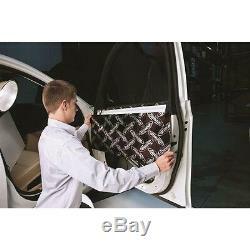 The item "Dynamat Xtreme Bulk Pack Insulation Sound Mat Sheet For Kit Car" is in sale since Monday, November 16, 2015. 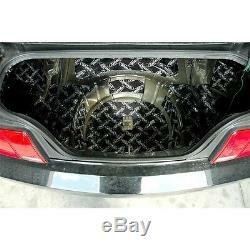 This item is in the category "Vehicle Parts & Accessories\In-Car Technology, GPS & Security\Other In-Car Technology". The seller is "carbuildersolutions" and is located in Kent, UK. This item can be shipped to North, South, or Latin America, all countries in Europe, all countries in continental Asia, Australia.